As 2018 draws to a close, now is the perfect time to practice gratitude for the year that has passed and look ahead to what you want to create in 2019. Whether you’ve had a great year, a challenging year, or a little bit of both, there is always something to be thankful for. Being grateful resets our mind to focus on the good things in our lives and takes attention away from painful experiences where it’s easy to bogged down with anger, grief or sadness. Start with a list of 10 things you are grateful for in 2018. Did you have a wonderful vacation? Are you surrounded by good friends that nourish your soul? Perhaps you created some lasting family memories or welcomed a new baby into your circle. Maybe you overcame a significant challenge or finally achieved a goal you had been working towards. Every one of us can find 10 things to appreciate in our lives. Now that you’re written down your gratitude list, think about what 2019 would bring if you could dream up your ideal year. I like to create a vision board every January 1st that sets my intentions for the next 12 months. I pick up a poster board from the Dollar Store and gather some magazines for inspiration. Google is also a great tool - just type into the search bar what you would like to manifest, click on the Images tab, find an image that resonates with you and print. Using the magazine and printed images, I then start placing the photos on the poster board. Feel free to be as creative as you like. If you’re artsy, grab some markers and add your own drawings. The vision board should be for your eyes only so don’t be self-conscious about what it looks like. Some of the images featured on my vision board include a map of Europe as a travel goal for 2019, a perfectly-executed Wheel pose to inspire me to keep up my yoga practice, the words “Meditate Every Day” to remind me to stay on track and a photo of a new bike I would like to save up for. Really take some time to consider what you would like to manifest in 2019. Is it a new job? A new relationship? A health goal, like losing weight or running a marathon? The options are only limited by your imagination. 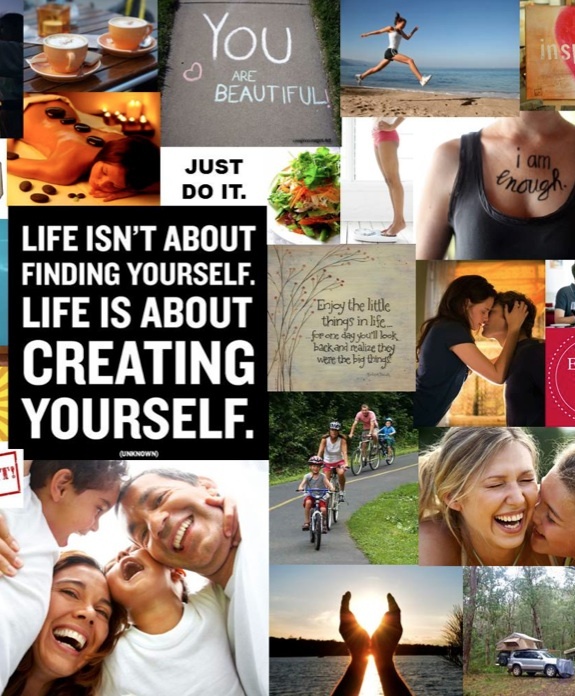 Once your vision board is complete, place it where you can see it every day. I place mine directly across from my bed so that it’s the last thing I see before I fall asleep and the first thing I see in the morning. I spend a few minutes each day really absorbing the images and thinking as though they have already come to fruition in my life. Like how it feels to be riding my new bike with the wind in my hair, or packing my suitcase for Europe. Sometimes I’ll be chatting on the telephone and simply staring at my vision board. My attention is focused on the telephone conversation but my eyes are taking in the images the whole time. Intentional thoughts are powerful and persuasive on your subconscious so don’t miss an opportunity to shape 2019 into exactly what your heart desires. This time next year you’ll be writing down what you’re grateful for, knowing you were the creator all along. We are so Grateful for all the supporting businesses of Live Yoga here in White Rock and the Lower mainland. Thanks so much for helping to make great yoga available to everyone here in white rock! Here are the businesses who graciously donated gifts to our 2016 open house. Sin 7 salon, Float House South Surrey, Lululemon, Halfmoon Yoga, DesLauries Chiropractic, Motino Chiropractic, Buena Vista Massage, Zed to Health, Laura's Coffee Corner, Angelic Teapot, and Five Corners Vietnamese. Please check out all of these amazing local businesses! In the second sutra Patanjali explains what yoga could be (this is open to debate). To stop our thinking mind or any movements or fluctuations of consciousness. I agree that it is enjoyable to have an experience free from thought or a clear calm mind but consider that as a permanent state. If this is the goal of yoga would our lives benefit by being in a state of thoughtlessness? If we emancipate ourselves from thoughts and ascend to the state of "yoga" how will our family feel, how will we make a living and work? Would we still be part of society? I think it is very important to consider what yoga means to us. Being aware of our thoughts is a great tool to bring more balance into our life. As we practice stilling the mind often mental habits, influences, and life experiences come up and inhibit yoga. This is when the real yoga begins as we shift our lifestyle and habits to support calmness, balance, stillness, and of course, yoga. The practice irons out the wrinkles of habit, influences, and mental turbulence or at least makes us aware of these factors that draw are attention away from deeper states of focus, mindfulness, or connection. My thoughts on permanence are influenced by nature. There is life and death and nothing escapes this cycle. In the natural world there is no permanence as things come and go. We cannot be in a constant state of inhalation as the exhalation must come to rid the lungs of carbon dioxide. So to I feel that reaching a permanent state of yoga is impossible. In the pages to come, Patanjali lays out practices and revelations on how to calm the mind and body and reach states of yoga but then we come down, back to our life, our world. The practice is there for us to find yoga but not to hold it. In ancient times sages and ascetics (or yogi's) would renounce life duties to pursue states of yoga (if any succeeded?). Even in todays world I can't find proof that any practitioners have reached permanent states of enlightenment or yogic consciousness through yoga practice. So what if experiencing glimpses of the states of yoga help us to wake up to the situations in our lives. Can stilling the fluctuations of the mind bring clarity and intimacy with our world? Is it possible to have an open understanding of what yoga is? I feel that every human on the planet at some point in there life questions what consciousness is and try to understand how to calm the mind to catch a glimpse of what is happening on a deeper level. We all crave a connection to the inner quietude. In the first sutra Patanjali immediately opens the practice to anyone who wishes to experience their consciousness. Regardless of caste, religion, or upbringing we are intrigued to delve into the practice of yoga. This first line instantly sparks curiosity into the reader. What is Yoga? Why should I practice? Is it my right to inquire further into my state of mind? I feel comforted by the potential of the pages to come that will bring an inquiry or investigation into the deeper parts of myself, my community, and my life. Yoga has many meaning and those meanings will change as I go through life but committing to this inquiry of yoga I will always have new findings to share. Check back soon as I will reflect on the Sutras of Patanjali. The yoga sutras of Patanjali are a rich and contemplative arrangement of 196 sutras (aphorism) that challenge the reader to consider his/her own consciousness and understanding of what makes up reality. I’m no expert on the Yoga Sutras but am drawn with intrigue towards the teachings as they are open to interpretation. I’ve decided to share my reflections on the sutras in a very accessible and open presentation. I hope everyone becomes curious to discuss and comment on what these sutra bring up in their understanding and experience. Was Patanjali a magical sage? A group of philosophers? Half snake have man (really!)? Nobody really knows but the sutras are possibly as old as 400 CE (wiki). I’ve read that philosophers and authors in those times were rewarded and celebrated for removing even one syllable. So the sutras are dense with meaning. Sutras were traditionally chanted. A lot! In order for the student to memorize each one and meditate upon their meaning. As I have just began to delve into the yoga sutras of Patanjali I’m sure my understanding will change over time as I consider the teachings. I hope you will join my journey! Patanjali’s yoga sutras make up the foundation of modern yoga practice and include the 8 limbs of ashtanga yoga which include; ethics (relations to others or yama), relations to oneself, posture (asana), freedom of breath (pranayama), freedom of the senses, focus, contemplation, and integration (the last 3 make up meditative practices). The sutras also touch on the patterned tensions of conscious and unconscious life with a goal of possibly unbinding oneself from these happenings. As there are many translations there comes many understandings of what Patanjali was recommending. There is no central authority on what the sutras really mean as they are basically void of an author. I believe the meaning of each sutra is relative to the reader and the culture that she/he is part of. How can we let ancient teachings benefit our modern lives? This will be a long journey dissecting each sutra (potentially skipping a few). The beauty of philosophy is the teachings are open to contemplate. The practices there to experience. It is up to us to give them meaning. In my last edition of my blog on Healing Back Pain through yoga I will finally get to the physical; the body, the muscles, and the yoga poses. Before that I would like to reiterate how important our lifestyle, environment, and how we deal with emotions and mental stress are to our wellbeing. It is difficult to practice yoga poses mindfully if the rest of your life is in turmoil. In the following, I’ll try to capture the essence of physical yoga practice as a healing modality. My first recommendation is to find good quality instruction with a teacher who will support, encourage, and facilitate how to practice yoga postures in a beneficial way. This implies individual attention to your body and back pain conditions. If you have minimal experience in practicing yoga it is especially important to practice the poses with good alignment and also attention from an experienced teacher – someone who will demonstrate how to stay safe during your practice. As a teacher observes your body in yoga poses she/he can make recommendations on how to adapt the poses to suit the uniqueness of your body in comparison to other students. Working 1 on 1 in private yoga classes is even better when starting out. This will assist you to develop a home yoga practice to heal your back. The relationship between teacher and student should always be supportive to the growth, wellbeing, and most importantly, the independence of the student. It takes time to understand which poses will relieve your back pain but the teacher can ensure you aren’t practicing in a way that worsens any symptoms you may experience. Yoga practice also takes time to master each pose and to progress your understanding of how the body functions in the pose. Once you have learned some poses that bring relief from back pain you need to do them regularly. This is the independence that the yoga teachers impart to you, the knowledge of how to develop a home yoga practice. When the body is in pain and we do nothing, there is no change. When we find yoga poses that reduce or relieve pain, we must experience this relief over and over and over again for a change to take place. For a new pattern or habit to develop in our body there must be repetition, especially if you have experienced chronic pain cycles. A home yoga practice is empowering to the students who learn to free themselves from pain! I’ll shed light on how I began to end my chronic back pain. As a machinist and engineer I spent long shifts hunched over computers and metal working machines working on high stress projects. My posture and work environment promoted this chronic pain even after work, while I was relaxing at home. Practicing yoga, I noticed that a simple spinal stretch with my hands on the wall would temporarily relieve my back pain. It then became my duty that, whenever my pain cycle began, I would end it then and there by taking 30 seconds to practice spinal stretch (wall dog or ardha uttanasana). I would do this during lunch, while shopping, on the trunk of my car, while skiing or halfway through a movie. It worked! I broke the spell of what I thought would be a never-ending pain cycle and, more importantly, it happened of my own free will. Yoga practice will not heal your back by taking one class a week. It needs to happen on a daily basis so new postural habits are engrained in our cells, our mind, and our existence. Drop any idea you have of what your yoga practice should be. The mind is a funny thing. It often attaches itself to the idea that doing more, stretching more, or radically changing ourselves will bring about a wellness that will forever end our troubles. I do feel that we need a positive outlook but, if positivity keeps our mind contemplating what we think our practice should be, it distracts us from actually being in our bodies while practicing. Expecting our yoga practice to magically heal us overnight might also bring disappointment, as there is rarely such instant gratification. Yoga takes time, care, and patience. Any movement, stretching, or activity done in good alignment will bring about wellbeing eventually. Yoga practice hones our awareness to observe our body during each pose and during each action executed. Throughout life we will experience many physical circumstances that will require us to drastically change our approach to yoga practice. Not only does this diversify our skills as yoga practitioners but helps us break down habits and attachments to certain postural habits, exercises, and way of being. A yogi is nor just physically flexible but also mentally flexible. All of this practice keeps us receptive. We feel our muscles, bones, and skin with great intimacy and even catch glimpses of the inner happenings of the body including the nerves, breath, and energy. The study of the self gives us the knowledge to intuitively heal ourselves. Once we have an understanding of how to feel good in our body that becomes our yoga practice, the maintenance of a light, subtle, and receptive body and mind. My final thoughts about healing back pain with yoga practice are to get some support, practice with others, make new friends and most importantly be nice to your self. It is possible to physically heal our body all on our own yet the journey is enriched when you share it with others. Connecting with others, sharing conversation, thoughts, and emotions heals us on a much deeper level as it brings a deep satisfaction to our lives. We all crave friendship and you can find it very easily at any local yoga studio. There are many seekers on the path to bring more balance to their lives. When you learn to be kind to others you learn to be kind to yourself. This connection to community and others with similar struggles and goals will encourage and support wellbeing more that words can describe. I hope you have enjoyed these reflections and have found a new curiosity towards your own body and mind.